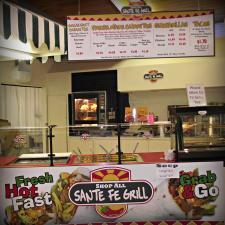 We offer a full variety of Mexican Food favorites in the Shop-all Sante Fe Grill. Step up and order your favorite and we will prepare it FRESH right before your eyes. Pick your fresh ingredients from a large selection and build your own Quesadilla, Burrito, Taco & Breakfast Burrito. Add plenty of Roasted Green Chiles for a flavorful experience! !